THE SKINNY: After a trip to the beach, my skin is always in need of some work. Maybe it's the sand and salt ... or maybe it is the neglect while I am vacationing the days away. So I saved this little packet for my return-home-routine and it was AMAZING. 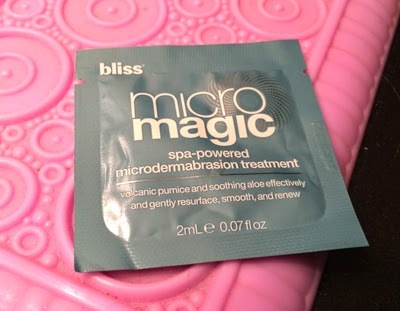 Bliss Micro Magic Microdermabrasion Treatment is the best I have ever tried. It was light and not too rough on the skin. But it easily sloughed away all the ick while making my skin feel super-smooth. Unlike a lot of other things on my sensitive skin, this did not cause redness or irritation of any kind. According to Bliss this is a "skin-smoothing volcanic pumice, conditioning vitamin E and soothing aloe that help gently treat the appearance of dullness and surface imperfections to give your skin a fresher, softer, more revitalized look and feel for spa-perfect results at home." And that is right on the mark. The only downside is the price. But I am going to go for it. This made my skin feel great in a way that few other products have been able to. KEEP OR TOSS: Keep. Look for more samples ASAP! CHECK IT OUT: You can buy direct from Bliss, where on-site ratings are also really good, or retailers such as Ulta or Sephora.